Lucy Laffoon poses in front of Laffoon Legal Services. Glenwood Springs and Grand Avenue welcome our locals and our visitors every day to town and the Roaring Fork Valley. The Glenwood Springs Garden Club has been proactive in helping to make the main street through our town and our business corners more visually attractive. We are pleased to see that is happening. Several businesses also have taken personal pride in further beautifying their entrances along downtown streets with flowers and plantings. 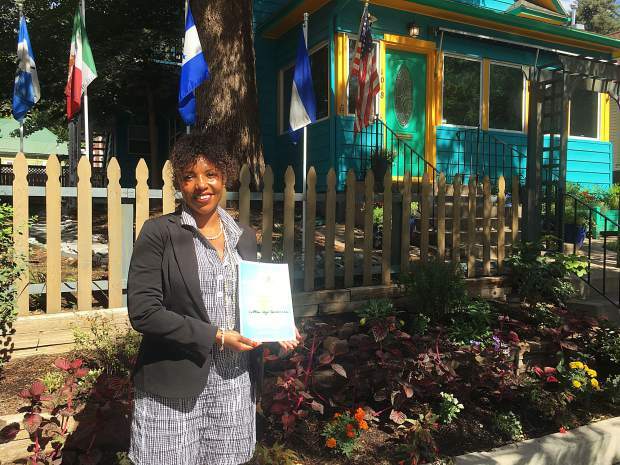 To encourage more businesses to add flowers and visual appeal, this month the Garden Club has selected a Grand Avenue business as Yard of the Month. Laffoon Legal Services, located at 1018 Grand Ave. has in less than a year created a most attractive yard and entrance. Lucy Laffoon, attorney at law, purchased the Victorian house on Grand for her law firm less than one year ago. She was most excited when Yard of the Month Committee members presented her with this award. She loves to garden and has even more plans for further landscaping her business property. She expressed to us the same goal that our Garden Club has — to increase the beautification of our town. Laffoon has personally selected most of the flowers and bushes and has planted some herself, even though she has a busy law practice and drives back and forth to Denver often. This new landscape features many perennials and bushes, and ideally it is infused with annuals for added color and texture amid the new plants. She selected Dwyer Greens and Flowers to help with landscape plans and irrigation, and to prepare the yard. The front landscape is in levels along the sidewalk, with a picket fence centered with a newly planted grape arbor, followed by more flowers and bushes up to the front entrance. Flags of various immigrant countries and the USA add to the welcoming entrance of this business that specializes in immigration. Stones and grasses and additional plants and flower beds surround the house. Laffoon plans to add a small pond and a cascading water feature on one side of the house, which will be visible from the street and sidewalk. She wants the water to reflect off the bright blue paint she selected to create a Victorian Caribbean home look, common on many islands like Belize, from which her mother immigrated to the U.S. “I debated on the brighter colors, as this is not traditional for Victorian homes here, but in honor of my mother’s memory and her home country, I went with the brighter colors and called it Blue Bayou, a song she liked to sing,” she said. The flowers and landscaping plus the colorful blue paint and trim definitely catch the eye of people who stroll, bike or drive by the house. This whole front yard landscape plus the future plans of Laffoon definitely help to beautify Grand Avenue. The Garden Club encourages everyone to stop and admire the colorful and welcoming Laffoon Legal Services house on Grand Avenue. We trust this cheerful and picturesque yard, created in less than a year by its owner, just may encourage others to add more colorful plants in front of homes and businesses along our downtown streets. Ann English is past president of the Glenwood Springs Garden Club and a member of the Yard of the Month Committee.